This project is entered into this week's Crazy Crafters Project Highlights. Click here to see the other great projects and vote for your favourites. 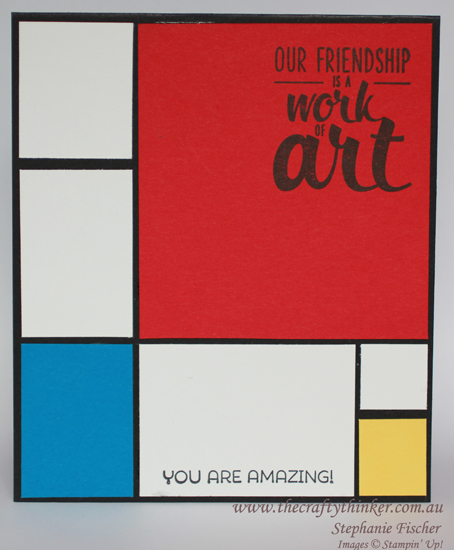 I was first introduced to the work of Piet Mondrian while studying History of Art .... a long time ago now! It had immediate appeal for me which has grown, rather than diminished, with the years. 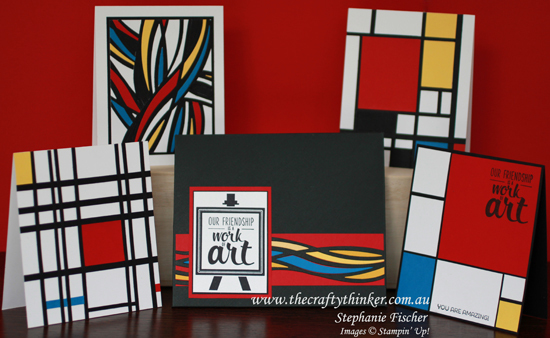 In making a set of cards as a gift, I turned to Mondrian for inspiration ... and I think he came up trumps! 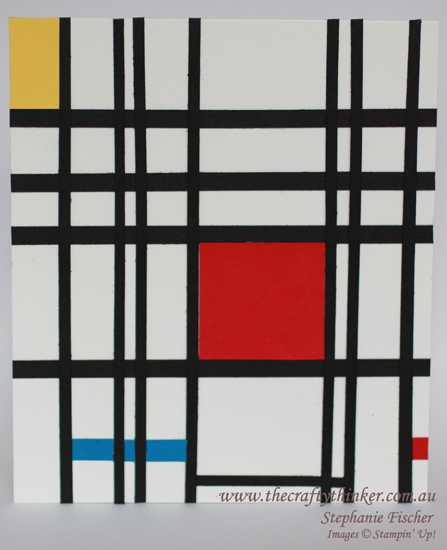 I started out with Composition with Red, Blue and Yellow (he painted it in 1930 but it's still fresh and appealing today) because there were more bold blocks of colour than lines. I added a couple of stamped greetings because the large blocks seemed to require it. 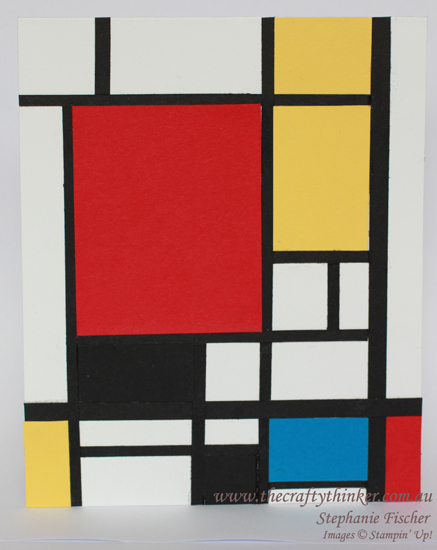 Composition with Red, Yellow, Blue and Black (one of his 1921 pieces). To suit the medium of cardmaking and my abilities, I had to make some adjustments to the designs but I hope I have managed to maintain the balance that is so important in his designs. 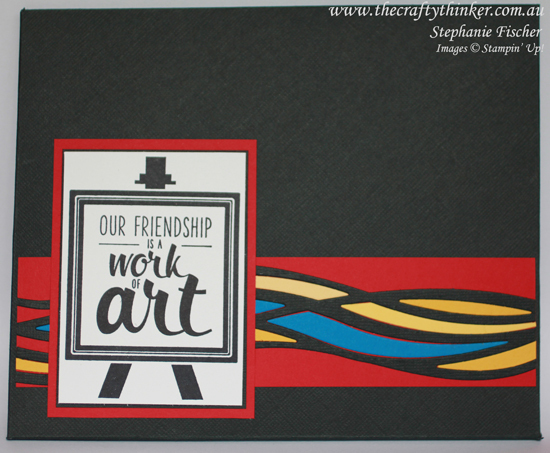 All of this was inevitably and inexorably leading me back to present day Stampin' Up! and the wonderful new Swirly Scribbles thinlits! 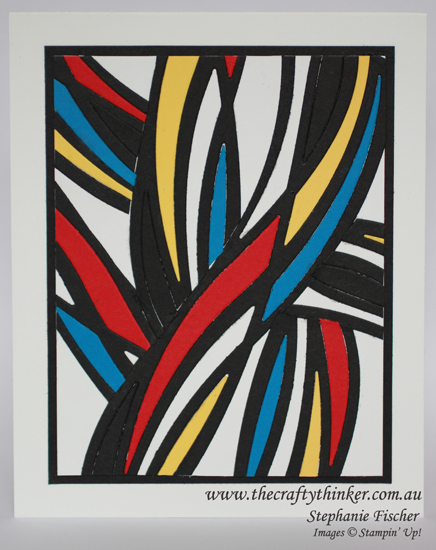 I cut the Swirly Scribbles several times in Basic Black and adhered them to a piece of Whisper White cardstock in a design that I found pleasing. Then I used the same die with Real Red, Daffodil Delight and Pacific Point cardstock. After adhering the pieces that I wanted to complete my design, I kept the rest for later projects. I like the card case so much, I'm going to make a card version of it! I used the easel and greeting from the Painter's Palette stamp set to cover the join in the Swirly Scribbles! Thank you for visiting, I hope you enjoyed this card set. This project is entered into the International Blog Highlight - do visit it to see the other great projects and vote for your favourites.